Happy hour is a closely held ritual here at the farm and we typically whip up something simple to snack on while we sip a beer, wine, cocktail or tea. I love clinking glasses with Taylor (and neighbors) at the end of a hard day. There’s something really special about reflecting on the day’s work and chatting about what was rad, difficult or what we can do to make the following day more productive. It’s our sacred time and something we’ve done for years. These warm dates with olive oil, sea salt and lemon zest are amazing. Sweet and savory is my jam and these little guys don’t disappoint. The dates are sautéed in olive oil until they become soft and almost caramel-like. Then they’re sprinkled with flakey sea salt, lemon zest and drizzled with the warm oil they were cooked in. This appetizer is simple, flavorful and can be whipped up in no time. If you want to jazz this up a bit more I’d serve these dates with plain yogurt or serve on top of crusty bread with ricotta or goat cheese. This is a great snack with an adult beverage or simply as a mid afternoon pick-me-up with a cup of coffee or tea. I hope you all enjoy these warm dates as much as we do. They’re inspired by food52. 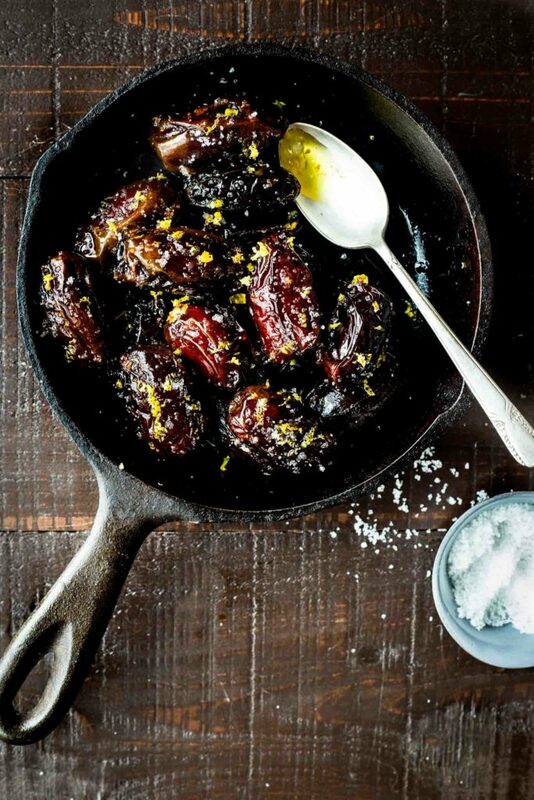 Serve the dates on a plate with a sprinkling of flakey sea salt, a pinch of lemon zest and a drizzle of the hot oil. *I chose to use un-pitted Medjool dates because they'll cook a bit longer without burning which results in a softer more tender date. If you use pitted dates or slice them and pit them, note the cooking time will be less and they could burn more easily. I just want you to know that I love your blog. I stumbled upon it and have gotten my mom and aunts completely addicted to it. Thanks for sharing such beautiful and yummy food with the world. I can’t wait to make these warm dates. Are you using a particular type of date? Do you have a tree? I have no experience with dates but this does sound good, especially your suggestion of having them on top of ricotta. I used Medjool dates but you can use any dried date variety that you’d like. This is a forgiving recipe and more of a technique rather than a strict guide. I hope you like these as much as we do. Let me know if you try them! Cheers! This sounds fabulous but I think I’ll try it with a twist……will stuff some with blue cheese and some with goat cheese, drizzle with oil & lemon and roast (grill?) instead of frying. I just bought some Tunisian dates from Costco and I can’t wait to try this. I’ll let you know how it turns out. Could be an epic fail…..
YUM! I can’t wait to make these little jewels! These were amazing. Served as Super Bowl snack along with goat cheese and toasted French bread. Crowd loved ! Did use pitted dates and cut in half to be more bite size. so happy you loved them!